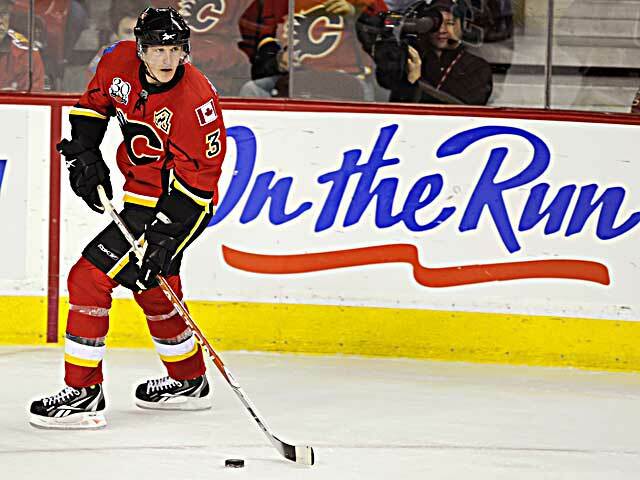 As everyone in the hockey world has heard, Brian Burke completed two massive trades Sunday with the Calgary Flames and Anaheim Ducks. Dion Phaneuf and Jean-Sebastien Giguere are the biggest acquisitions made by a Leafs team that looks drastically different from the version that took the ice against the New Jersey Devils Saturday night. Both trades are intriguing, re-arranging Toronto’s salary cap and improving the Maple Leafs on-ice product in three major ways. 1. Dion Phaneuf adds depth to the Leafs’ blue-line. Phaneuf was the best player involved in the trade with Calgary. I know it’s a saying that’s been repeated a lot in the wake of these deals, but that doesn’t make it untrue. On paper, Toronto has a fantastic defensive corps with Tomas Kaberle, Francois Beauchemin, Mike Komisarek, Luke Schenn, Carl Gunnarson and now Phaneuf. The 6’3, 214 pound native of Edmonton will be the kind of physical presence that the Leafs are trying to trademark. Phaneuf will also help Toronto flesh out its power play. Best of all, he’s just 24, meaning he’s got at least a decade left in his career. Definitely a win for Burke. 2. Getting rid of Jason Blake’s outrageously bad shot selection. Most people have focused on dropping Blake’s 4.5 million per season, but coach Ron Wilson must be thrilled to have the phrases “Blake takes a wristshot from the faceoff circle” and “Blake with the wrap-around attempt” removed from Toronto’s television broadcasts. The statistics are telling: in the past three years he’s taken 804 shots on goal, scoring 50 times. That’s a 6.2% success rate, folks. Put another way, in his time with the Leafs Blake averaged nearly 4 shots a game, but put the puck in the back of the net once every four games. Think of all the turnovers in that other 75% of games where he was off the mark. If that’s not addition by subtraction, I don't know what is. 3. Jean-Sebastien Giguere is a big improvement over Vesa Toskala. Giguere has been to the Stanley Cup final twice and won the whole thing a couple of years ago. Although he’s struggled of late, reuniting with goalie coach Francois Allaire should put him on the right path again. In any event, Giggy can definitely be a starting goaltender and also mentor Jonas Gustavsson. The one drawback of these deals is the departure of Niklas Hagman, who was Toronto’s best two-way forward. He was the team’s most consistent scorer and always showed a lot of grit on the ice. However, the good far outweighs the bad for the Toronto Maple Leafs on these trades, and Burke has made some serious moves that will improve Toronto next season without giving up any draft picks, prospects or cap space. Sunday was definitely a banner day in Leafs nation.